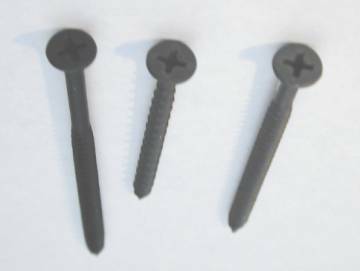 The Meaning of "drywall screw"
drive, head, thread are parts of "drywall screw"
Thin rod with spiral threads, pointed on one end and with a head on other end. Fastens drywall sheets to studs. Usually manufactured from metal. Can have coarse or fine thread. Can be quickly rotated into drywall during construction work. We attach the drywall on the ceilings first with drywall screws and the drywall on the walls second with drywall nails. 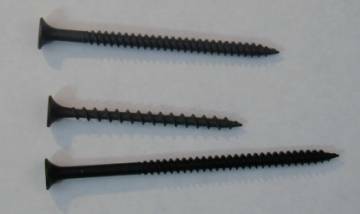 The reason you use a drywall screw is this: it's tough.